Growing up on post-boom Lagarto, Juno is but one of the many who live in despair. Once he was a young cop in the police department of the capital city of Koba. That was before he started taking bribes from Koba’s powerful organized crime syndicate. Yet despite his past sins, some small part of him has not given up hope. So he risks his life, his marriage and his job to expose a cabal that would enslave the planet for its own profit. But he's got more pressing problems, when he's confronted with a dead man, a short-list of leads, and the obligatory question: who done it? Set up for a fall, partnered with a beautiful young woman whose main job is to betray him, and caught in a squeeze between the police chief and the crooked mayor, Juno is a compelling, sympathetic hero on a world that has no heroes. An exciting science fiction adventure and a dark, gritty noir thriller told in taut, powerful prose, Kop is a remarkable debut novel. 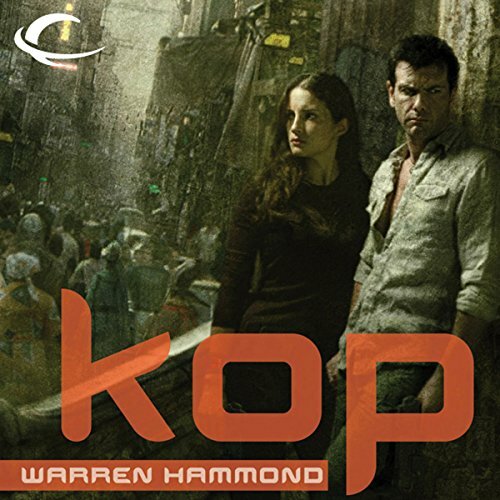 ©2007 Warren Hammond (P)2012 Audible, Inc.
What would have made KOP better? Absolutely hated it. Not the performance was good, and the writing isn't bad, but the premise really, really stinks. We are to understand that the MIXED_RACE decendants of space age share-croppers live a hopeless, wretched squallid, existence on a panet so fertize that the forest has to be regularly burned, because the"Eurt-Mun do want to buy the moon-shine no-moe". Yikes......the whole world is theirs! I will not be buying book 2. If you like noir tales of the Dashiell Hammett variety, and aren't afraid of a little sci fi, then I think you'll enjoy this. The sci fi setting isn't overpowering given the premise - interplanetary travel is possible, but the detective is working on a destitute planet. The poverty keeps the story grounded in pulp feel, and there's enough sci fi for the author to play with some fun scenarios.